Your guinea pig or cavie is a very social animal. He communicates through several different body postures and sounds, telling you and his fellow cavies how he feels. Look for happy, mating and aggressive sounds and postures from your little cavie. When you hear your guinea pig grunting or purring, you know he’s happy and content as he moves around his little home. You might also hear your cavie making a “chutting” sound. He’s muttering to himself because he’s happy and relaxed. When you hold and pet him, he may chut. “Wheek! Wheek!” You’ll hear this when your guinea pig is hungry, wanting some fresh food. It sounds like a whistle. Your cavie is “wheeking” as he asks for food. Some guineas will chirp when they are very happy and content. If you hear what sounds like a bird singing, go look and see if your guinea pig is chirping -- his lips will move in and out. Oh, beware these sounds! Your guinea pig is warning you that all is not well in his world. He may shriek or squeal, giving a warning. If you hear a low-pitched rumble, telling you your guinea pig doesn’t like an action or sound he sees or hears. When you hear your guinea pig’s teeth chattering, go to his cage right away -- he is very angry and warning any other guinea pigs you may own to stay away. Drop a towel on them and separate them immediately to prevent injury to one or both of your cavies. Cavies do whine. When they do, they are indicating their unhappiness with another cavie’s actions. A calm and happy guinea pig stretches out, especially when he knows he’s safe. When you see this, you’ll also hear your cavie chirping, purring or chutting. When your guinea pig is caring for and reassuring a baby guinea pig, she’ll coo. A guinea pig that has just been rejected will point his nose up and turn his head away. It can also be considered a defensive position. A female guinea pig who’s in the mood for some mating will sway her hips from side to side as she either purrs or chatters her teeth together. She’ll combine the hip-swaying movement with a circling motion as well. When she goes into heat, she’ll flatten her back and raise her hind end with her rear feet separated. This allows an interested male to mate with her. The guinea pig will also use this posture to prevent being attacked. When you see your guinea pig with his head raised, front legs fully extended, his mouth opened and his teeth chattering, he’s warning all in the vicinity that he’s ready for a fight. He wants to frighten an opponent. If you see him with raised fur, he could either be alarmed or approaching an aggressive mood. This body language is usually male-on-male. Two male guinea pigs chasing each other in a circle are getting ready to get involved in a fight. If a male cavie is chasing a female cavie, this is considered to be mating behavior. Guinea pigs who feel very playful and excited will hop up and down in place. This is “popcorning,” letting you know that your cavies are happy and playing. They will mix popcorning with running around and chasing each other as they play. 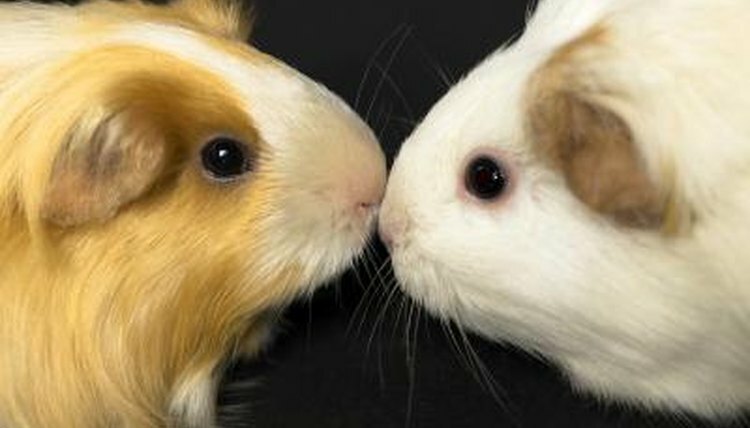 If you notice two guinea pigs touching noses with each other, they are sniffing at each other. This is a posture that guinea pigs use when they are getting to know each other. What Does It Mean When Iguanas Wag Their Heads? What Does it Mean When Guinea Pigs Vibrate? How Do Hedgehogs Communicate to Each Other? What Does a Hamster Do When It Is Angry? What Are the Differences Between Male and Female Bottlenose Dolphins? What Is the Meaning of Dogs Lifting Their Paws? Why Do My Bearded Dragons Bob Their Heads? How Does a Mongoose Protect Itself? What Causes Bloodhounds to Attack?